Hitting the “gain staging” wall is a lesson that everyone remembers. Mine was in 2005: I was finishing a video scoring project at Musicians Institute and I was re-scoring the trailer for Hellboy, as part of my final. I had lots of electronic sounds, a virtual orchestra with percussion... it was a huge session. I reached a point where things sound the way I like: “I only have to bring in the electronic percussions and I am done”, I think.. overly-excited for being able to go home early, that day. As soon as I brought those additional tracks in, my double basses disappeared. "Mh.. let’s bring them up.. now the cellos are weak.. I wish I had a bit more timpani.. what’s that grinding sound? Ah! My mix buss is clipping. I'll bring its input down.. now I am no longer clipping but the mix sounds off-balance, lifeless and dull." My idea of going home early started vanishing in front of my eyes, I had no idea how to get back to that “ok”-sounding mix, and in the distance I started hearing the sad sound of a viola solo. It was clear that it couldn't get any worse. The issue - that day - was partly due to my lack of knowledge of gain staging. If you ask me, gain staging is the technique of consciously managing the gain of one or more tracks across the entire path of their described audio signal. Being aware of how gain affects your audio signal and your final result is a basic, yet fantastic (and often overlooked) skill to possess in recording, mixing and mastering. In a Digital Audio Workstation (DAW), the headroom of our session is determined by the amount of bits available. Since waveforms are described by numbers, those bits determine the maximum value for a waveform that the system can describe. The higher the gain, the louder the waveform, the more bits are used, the bigger the number. Once all of the bits are used, the system can no longer describe the waveform, a red light turns on to indicate that you are “clipping” and the waveform you are recording/hearing will suffer from unwanted distortion. In the analog domain (think of a tape machine) things are different. The analog device has a sweet-spot (0 VU on its meter, usually) of operation and its tone and color change when hitting it lower or higher than that. If you keep going higher by adding gain, you will reach a point where things will sound clearly distorted, because the device cannot capture your intended signal with its “analog” counterpart (e.g. electric to magnetic, on a tape machine). you make everybody else softer: the mix lacks life, sounds completely different and needs re-doing? It’s a mess. I don’t like it when that happens and it tells me the recording engineer has not cared much about gain staging (especially when musicians are recorded as overdubs). I like to send and receive recorded sessions (meaning “ready to be mixed”) in a way that, when someone presses Play, they will be intelligible and easy to understand. Sure, they will sound “rough” and unmixed, but it’s important to give the next engineer the best possible scenario for understanding what the intentions of the artist/band are. If things sound like the example above, can you determine whether the guitars or the keys have to be predominant in the song? This alone is a huge thing, really! Ah! Much easier now to get the general vibe. No matter how rough things are, you can always make them sound better by just gain staging the session. To do so, over the years, I’ve developed a general approach that seems to work all the time. I set my bass drum and snare drum levels to hit just a bit of the “yellow” area in Pro Tools - which turns out is around -24 dBfs RMS on the meter (peaks hitting from -6 to -3 dBfs). You can take this information to any DAW and build your visual reference. As a second step I set my monitoring volume to a comfortable amount. I have a stepped switch on my monitoring controller so I can almost always put it at the right level without even playing the music. Once set, I would recommend you keep it there and generally not touch it, or at least make an effort to bring it back to the original position whenever you touch it. If your monitors output enough volume, you will not be tempted to push the volume of your tracks in order for things to be heard. We’re mixing! The focus here is to “mix” the tracks, there’s little interest in the absolute volume level of the actual track. That’s why we created mastering engineers! At this point I can start bringing in all the elements of the mix and set general volumes, while the bass drum and snare drum are playing (always with those!). Important: I don’t set the track volume with the volume fader of that channel! I keep that at zero and use a “trim” at the beginning of the channel, instead. 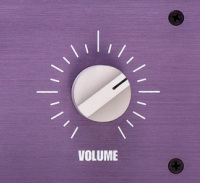 A “trim” is a general volume knob or fader whose purpose is only to change the gain of a signal. This way I reserve my main track fader for automation and further changes at the end of the channel processing. Since the resolution on that fader is higher when closer to zero, keeping it around unity gain value is the best way to make use of its maximum resolution. 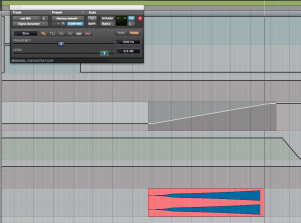 If you don’t want to use a plug-in, a great way to do it is to change the gain of the clip itself. Every DAW these days can do it and it’s a fantastic way to keep your session clean and sounding “right” from the get-go. By following this method, things will fall into place according to their loudness relation to kick and snare and once all the tracks are in.. look at the meter of the mix buss: it will probably be around -18 to -12 dBfs RMS. Plenty of headroom in case you need to bring somebody up a dB or two to be heard. Your mix will breath better, your automation will sound better and you’ll stay well away from the dreaded red light of clipping. Again, it makes all the difference. As you can see, I wanted a bit less vocals and a bit more effects. 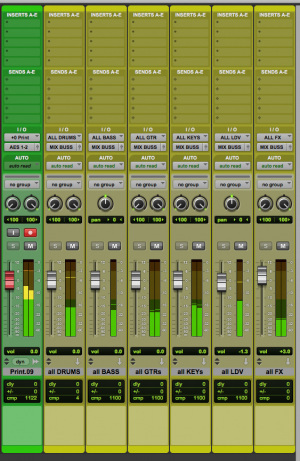 One quick way to do it was move the faders on the busses.. sometimes I even put a new Trim plug-in on those busses, input the values and then reset the faders to zero. You should be aware that gain staging is important even when just using an analog or digital device (especially when they pretend to emulate analog!). Beware: it's mostly subtle, but it's there! 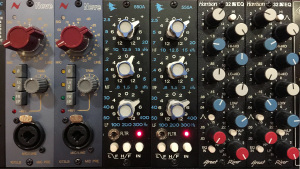 Every example has a different quantity of “current” flowing in the actual EQ circuitry. This makes the EQ sound slightly different from, for example: IN+12 OUT-12 (lots of gain pushing into the EQ) and IN-12 OUT+12. As you can tell, there’s still some difference, although maybe even smaller than in the hardware version. Knowing these subtleties will allow you to find out the level at each piece of analog hardware likes to be hit for a specific sound! Let’s go back to my busses and let’s put a compressor plug-in on all of them. 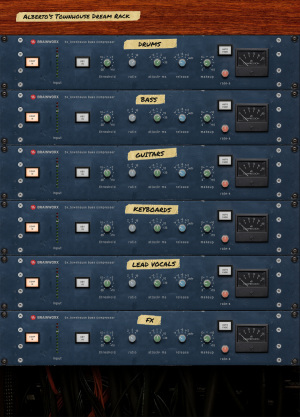 I’ve used the Brainworx Townhouse Compressor on all of them, with different settings for each bus. This unique piece of hardware has a great story and it would be a dream to have six of them in a rack, so since "one can dream" I made my own personal, virtual Townhouse rack (added geeky-ness: the cables at the bottom are an actual picture of the back of one of the racks, here at Fuseroom). First off, let’s send a 100 Hz sine wave through it. You will notice the yellow line being the normal sine. Now check what happens when we push gain through the compressor while engaged: the harmonic distortion of the emulation re-creates the changes that, supposedly, the hardware introduces. 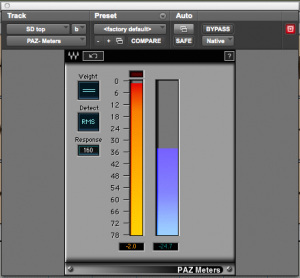 This means that, going into this plug-in louder or softer will not only affect the compression amount (hence the tone) but also the harmonic distortion applied to the track (the "tone of the box"). I told you gain staging was important! It gets more interesting: the output knob of this plug-in has a sound of its own and is not linear. 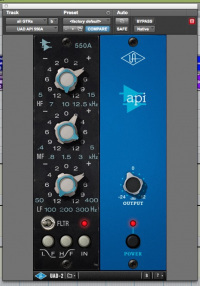 Look at the two pictures comparing a +13.5dB output gain done with a transparent Trim plug-in in Pro Tools or done with the output knob of the Townhouse compressor (yellow vs violet). This means that even that output gain knob is generating some color/tone. This becomes apparent if we play the song with different trim values before and after those compressors. By trimming all the buses down of the same amount (and then compensating) we're hitting the compressor differently, getting different amounts of compression and therefore a different tone and "glue" of the mix. At the end of your chain is your mix buss and nothing more than that can get affected by your gain staging. I always like to have control on my ways IN and OUT of that mix buss. 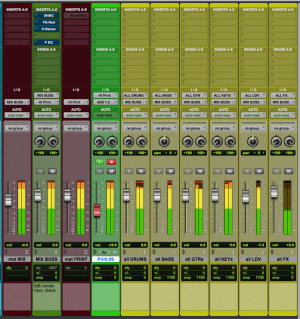 In Pro Tools you can do it with Master Channels (as you see in this picture, the red ones surrounding the green Mix Buss channel are respectively the way IN and OUT). The important thing is to have something completely transparent that handles the amount of gain in and out of that bus. 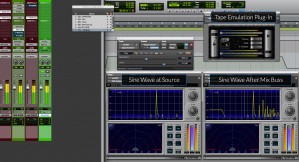 Let’s send a 1 kHz sine wave tone that slowly creeps in gain from -30 dBfs to -1 dBfs. 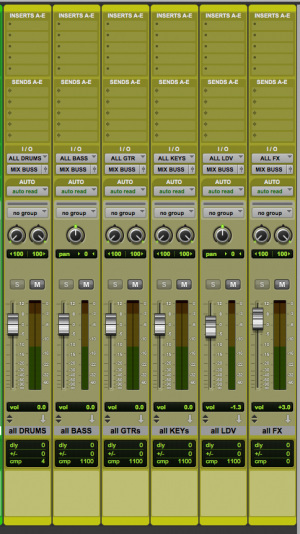 The first pass will be with the Mix Buss completely bypassed and the second one will be with the Mix Buss engaged. If you compare the two, one is perfectly linear (as to be expected from a simple sine sweep in digital) but the other is not. The fun thing is that - with the Mix Buss engaged - the loudness meter shows that the final gain is lower than the original for signals lower than (approximately) -16dBfs) and higher for signals above it, getting higher in difference the more we approach 0dBfs. Why is that? In theory, since we have compressors on the mix buss, we might expect the opposite. Compressors will start compressing when the Mix Buss is engaged, so the linear sine wave sweep should end up being the louder one. But this is not the case. The reason for this is the harmonic distortion that is introduced by all the plug-ins, especially the Valve/Tape emulation and the UAD Maximizer, ending up with the 88RS channel strip that I put there just for flavour (it does “something” to the sound, even when the channel strip is left completely flat). Even in this final case, understanding how the gain staging works from plug-in to plug-in in the chain and from the mix buss “as a whole” will help you find out the sweet spot and tune your final processing bus for the best result. Proper knowledge of gain staging makes it easy to mix straight into any processor, which is something I do all the time in hybrid mixing (and also in those rare cases of mixing entirely ITB). It actually makes my mixes easier, faster and effortless compared to the pain of going through a merely “transparent” virtual desk in my DAW. 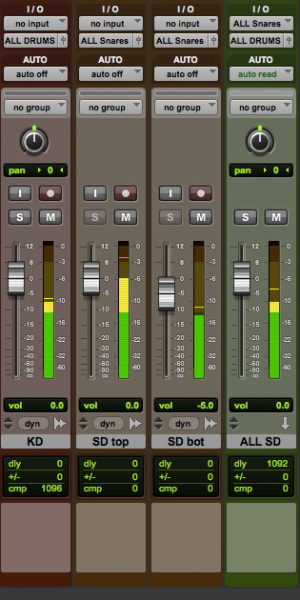 I know some of you like to keep your mix buss clean until the end of the mixing.. to each his/her own! Armed with this knowledge you can now face any session, from its initial stage to the finishing touches. No more being late to your date or hearing that sad, distant, viola solo in your head! 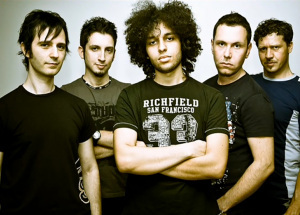 Their album "Sogni e Verità" was recorded, mixed and mastered in 2006 at the first, original location of Fuseroom Studio, in Firenze (Italy) by Alberto Rizzo Schettino. Here are all the test files in this article, for your comparisons and testing!